Picture this. We are standing 20 yards from the crystal blue Pacific Ocean on Kaanapali Beach in Maui. Tom works next to one of the most beautiful beaches in the world and he says that North Carolina has the best beaches he has ever visited. Bobby and I looked at each other with an expression of YOU HAVE GOT TO BE KIDDING! Tom went on to tell us how he had been stationed at Fort Bragg and loved to travel to Emerald Isle on weekends. He raved about the beautiful wide beaches and what fun it was to body surf and ride the Crystal Coast waves. When Bobby and I returned and took one of our typical trips to the Crystal Coast, I began to “see” treasures that I had taken for granted all these years. A wide beautiful beach, warm water (the average water temp in Maui is 76 degree…brrrr…) with a sandy bottom and lots of interesting shells. What they say is true. 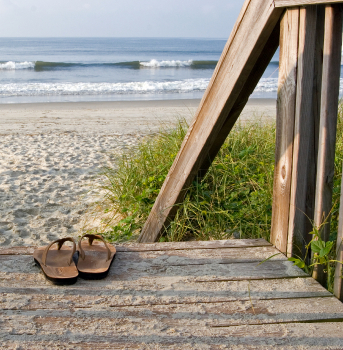 “There’s no place like home and home has some of the best beaches from Emerald Isle to Atlantic Beach. The next time you visit the Crystal Coast, maybe you too will have a whole new appreciation for our beautiful beaches too. Why don’t you share with us why you think the Crystal Coast is the best place to vacation.